The Agni V launch from Orissa's Wheeler Island. India now has the capability to target and destroy space satellites in orbit. 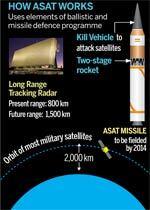 "Today, we have developed all the building blocks for an anti-satellite (ASAT) capability," scientific adviser to the defence minister and Defence Research and Development Organisation (DRDO) chief Vijay Saraswat told India Today. This capability has given India a deterrent against China. In January 2007, a Chinese asat missile destroyed an unused weather satellite. The test opened a new flank of vulnerability in India's $12 billion (Rs 60,000 crore) space infrastructure. India has 10 satellites including the Indian Space Research Organisation (ISRO) new Radar Imaging Satellite (RISAT) 1. Launched on April 26, the spy satellite can identify one-metre wide objects from space. China's alarming test spurred India's quest for a similar satellite-killing system. The successful April 19 trial of 5,500 km-Agni V Intermediate Range Ballistic Missile that Saraswat calls a "game changer", is another step towards the capability to target objects in space. 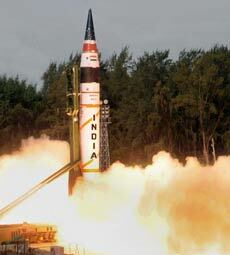 The missile scaled a height of 600 km before re-entering the atmosphere. "DRDO will field a full-fledged ASAT weapon based on Agni and ad-2 ballistic missile interceptor by 2014," says a top government source who does not want to be named. This weapon is unlikely to be publicly tested. This was confirmed by Saraswat who says that India will not test this capability through the destruction of a satellite. Such a test risked showering lethal debris in space that could damage existing satellites. Instead, India's ASAT capability would be fine-tuned through simulated electronic tests. Most military satellites orbit up to 2,000 km above the earth's surface in low earth orbit (LEO). Seeking to guide India's responses to this emerging threat, Space Security Coordination Group (SSCG) was set up in 2010. Chaired by the National Security Adviser Shiv Shankar Menon, SSCG involved representatives of DRDO, Indian Air Force (IAF) and National Technical Research Organisation (NTRO). Besides laying down the Government's space policy, this body will also coordinate response on an international code of conduct in space. The US responded to the Chinese test by downing an unused satellite in 2008. In June 2010, the US indicated that they would consider a new treaty for restrictions on space-based weapons. A new treaty would foreclose India's options for testing asat weapons. Indian analysts say it could lead to a new restrictive regime on space weapons, like the present treaties on testing and possession of nuclear weapons and long range ballistic missiles. The SSCG has directed DRDO to accelerate its ASAT capability. Another key ASAT milestone capability will be reached with the first test of a PDV interceptor later this year. This slender two-stage missile can destroy incoming ballistic missiles at an altitude of 150 km. The Ballistic Missile Defence (BMsD) project that aims to protect the country from hostile ballistic missiles has, in fact, developed the three critical elements required to destroy satellites. A long range radar able to detect them and a missile that can inject a "kill vehicle" or warhead into an orbit that actually homes in to destroy it. All these elements have been developed under the BMD programme. The DRDO's Long Range Tracking Radar can scan targets over 600 km away. The 'kill vehicle' has been developed as part of the ballistic missile system. It has both electronic and radio-frequency guidance that can home in on ballistic missiles and satellites. "Unlike a ballistic missile, a satellite has a predictive path. A satellite has a diameter of 1 meter while our BMD system can track and destroy targets less than 0.1 metres," says Saraswat.